Many countries around the world celebrate Flag Day on a date, that is specific for every nation. For instance, Venezuela observes this holiday on August 3. Original flag of Venezuela was introduced in by Francisco de Miranda and adopted by the National Congress in 1811. The first flag consisted of three horizontal equal stripes of yellow, blue and red colors and it was much adopted from the flags of Ecuador and Colombia. Later several modifications were made to the flag of Venezuela, including set of stars and multiple changes of placement of the stars, their quantity and optional addition of coat of arms at the upper-left corner. 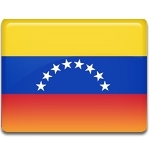 Three colors of the Venezuelan flag are symbolical for the nation. Yellow stands for wealth of the land, red is for courage and blue is for independence from Stain. Another interpretation of the flag is separation of “golden” America by a blue sea from bloody Spain. Till 2006 Flag Day in Venezuela was celebrated on March 12. But the date was changed to commemorate the first day, when current flag of Venezuela was flown. This event took place on August 3, 1806 over Venezuelan soil at La Vela de Coro.